The Vikings use an 11-2 run in the fourth quarter to earn a 57-52 win and advance to the Class AA North semifinals. 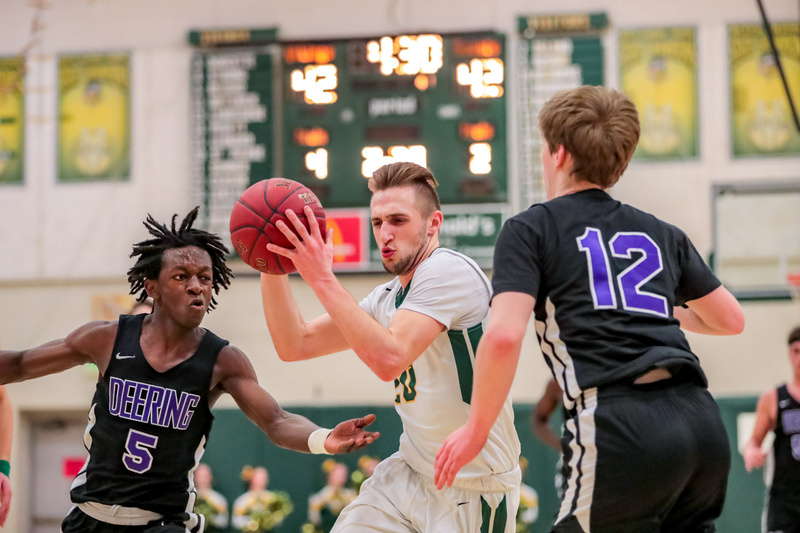 PARIS — Oxford Hills was a second-half team all season, and the pattern continued in the Class AA North boys’ basketball tournament. The third-seeded Vikings held No. 6 Deering without a basket for nearly four minutes during a deciding 11-2 run in the fourth quarter and emerged with a 57-52 win in Wednesday night’s quarterfinal. 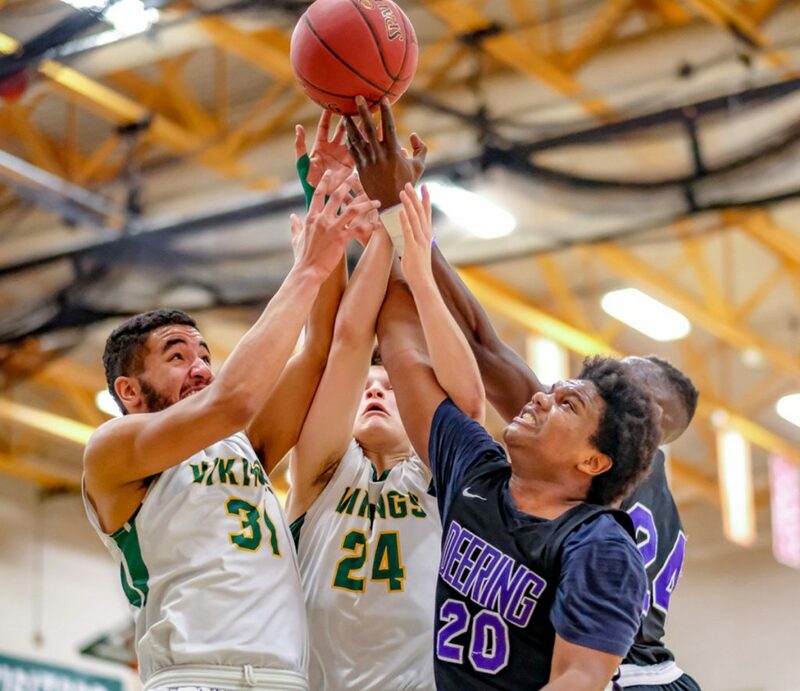 The Vikings (13-6) have won eight in a row and advance to the semifinals at 2 p.m. Tuesday against No. 2 Edward Little at Cross Insurance Arena in Portland. Deering ends at 8-11. Carson Coulton led a balanced scoring attack for the Vikings with 15 points, along with nine rebounds, four assists and three steals. Chris St. Pierre added 14 points and Spencer Strong 13 points. Oxford Hills’ Chris St. Pierre Drives the lane between Deering’s Nicsoni Bushiri, left, and Cole Martinson. 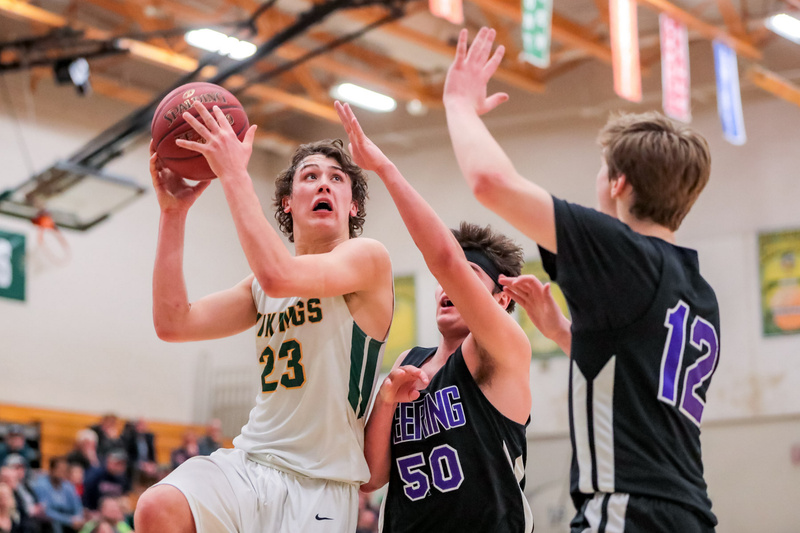 Cole Martinson paced Deering with 15 points on five 3-pointers. Nicsoni Bushiri added 12 and Ben Onek finished with nine points and nine rebounds. Darryl Germain’s 3-pointer tied the game for Deering at 42 with 5:43 left, which is where it stayed until St. Pierre drilled a 3-pointer to put the Vikings in front for good with 3:22 to go. An offensive foul called on Onek drew the ire of Deering Coach Todd Wing, who was assessed a technical foul. St. Pierre knocked down both free throws. More importantly, it was the fourth foul on Onek, AA North’s second-leading scorer (20.1 ppg). A pair of Blaze Vail free throws pulled the Rams within three again briefly before Janek Luksza found Carson for a bucket on an inbounds play to make it 49-44. Onek fouled out with 1:36 remaining, and Strong and Garrett Record converted back-to-back layups for a 53-44 lead. Deering’s next field goal didn’t come until Bushiri scored with under a minute left. Oxford Hills’ Colton Carson eyes the basket as he leaps above Deering’s Blaze Vail, center, and Cole Martinson. With Oxford Hills’ defense focused on containing Onek, Deering had little choice but to fire from the perimeter early. Martinson and Bushiri made the Vikings pay, combining for three 3-pointers as the Rams raced to a 20-13 lead after the first quarter. Oxford Hills, which beat the Rams 40-37 on Jan. 5, struggled to hit shots consistently in the first half (11 for 32). But strong work on the offensive boards by Carson, Keniston and St. Pierre supplied the Vikings with a dozen more shot attempts than the Rams (10 for 20). The Vikings, meanwhile, usually limited the Rams to one shot, and just eight points in the second quarter. Strong’s layup tied it up at 28 heading into halftime. Carson’s only 3-pointer of the game put the Vikings in front, 33-31, in the third. He also set up a cutting Keniston for a layup and St. Pierre for a wide-open 3 that helped the Vikings take a 40-36 lead into the fourth. St. Pierre usually drew the tough assignment of guarding the 6-foot-6 Onek, although the Vikings threw help defending him. “We did a nice job getting into Onek’s traveling lane so he’d have to turn it over or we’d draw the charge,” Graffam said.